At this time we don’t need to touch anything in the project setup, as we are quite happy with default settings and index.html being the start view for our mobile application. And in PhoneGap world its preferable to change settings via config.xml (it lists plugins and preferences for specific project) as opposed to tweaking objective-c implementation files. Above is the code from index.js and its quite self explanatory. During the initialize phase we have to bind to events and assign functions to be executed once these events fire. The full list of supported events can be found in PhoneGap documentation. At this time we only are interested in deviceready event and are going to come back to this part of code later to catch events once our mobile application will go to background state, will be retrieved from background state or will loose internet connection. 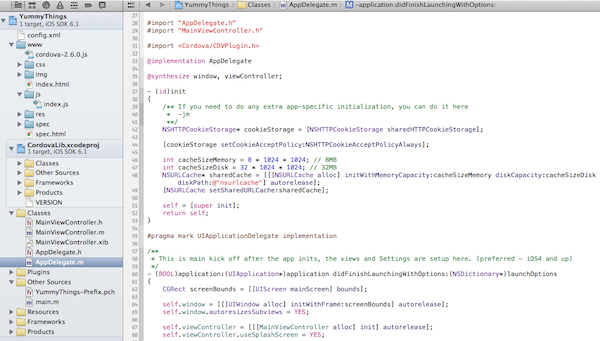 If you run your project now it will display alert once application is fully loaded and ready to function. More about elements for notification.alert you can read in documentation section. Now once we have some understanding about the key elements of PhoneGap based mobile application lets add functionality for consuming web API based data and for displaying received information. Being able to communicate with web based servers and devices is now becoming the key requirement for any useful mobile application. 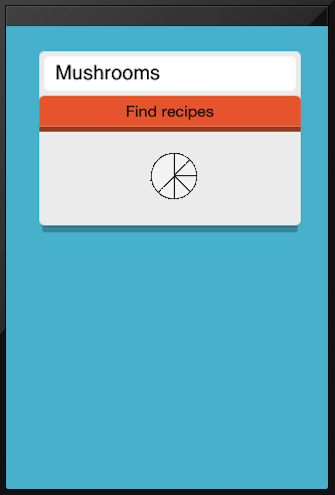 In the part 1 of this tutorial we decided to use Yummly.com API’s for retrieving recipes based on the ingredients our mobile application users like. Consuming data from 3rd party web services in most cases requires to obtain API credentials and authenticate your API calls by using them. Therefore its a common security practice for mobile app developers not to store such API credentials in the actual mobile application. In our project we are going to do just that. In the simplified way for this tutorial (but before you go live with your project, make sure your server side code runs securely). I have created the following simple PHP script to represent your server side code. If you are not a PHP guru, what this code does – it accepts incoming request from mobile client (with the list of ingredients – no sensitive data being sent over the network), uses received data to make a API call to 3rd party web service, parses received JSON response and returns 5 results wrapped into HTML markup code (not bad for PHP 60 liner, huh?). Feel free to copy this code to your server, or write similar functionality in the programming language you know best. The beauty of web services is that functionality is not dependent on programming language being used. To make our test project UI look beautiful I have reused some of the styles and markup from previous tutorials here on htmlcenter. Once compiled and run this is how our PhoneGap mobile project looks now. We did a lot of work in this tutorial (well done! for reaching this far) and now have created PhoneGap based mobile application which can consume content from external web servers and display results within iOS view. Similar technique can be used to dynamically change larger portions of mobile application content or styles (load them remotely from your back end if there were any changes made). This is the end of tutorial part 2. In the next part of this tutorial we are adding even more functionality: Local storage and Native Controls. I’m looking forward for any questions, comments and feedback, you can leave them in the comments area under the post or reach out to me on Twitter. Full source code for what we have done so far can be found and downloaded here. Have fun! Thanks for the great article on developing phonegap. Nice articles and very helpful for developing application..
hello hakim, glad to hear that our tutorials are useful! as for the error you get, it seams that you have the variable in your code which is maybe mistyped? maybe resqust variable should be something different? I’m a begginer in phonegap and I have found a small problem that I don’t know why it happen. Could you please explain the deal with the php file. I host it in my host and then where in the code i point it? Second question, my web service is not getting the recepi, is just in constant load ?? not sure I fully understand your questions. 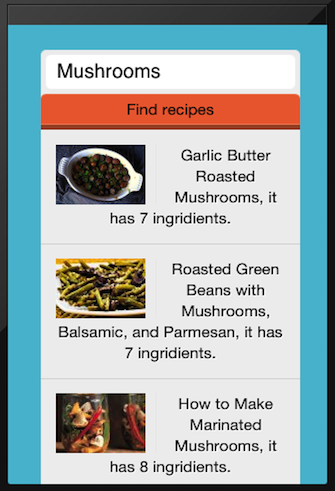 php example in tutorial creates / sends request to api.yummly.com and responds back with HTML to be displayed in MobileGap application. you have to upload it to your web server and point the PhoneGap application to it. Check another code block in the tutorial. not sure what do you mean by constant load for your web service. can you give more details? Learnt a lot from this tutorial. Thanks alot! Am glad to hear from you. Have some questions to ask now that I know you attend to comments. 1. Can I use MySQL database on my server? 2. How do I interface the info in the database of my server with the phone storage? 3. Does it mean that my php files will be on the server while the html will be wraped by phoneGap as hybrid app? 4. How do I ensure proper syncronization between data in the app and the one in the database in the server? Once this is triggered you could sync you local data with central database. I’m sure you could use this or other relational database for storing data. But once you think about mobile apps and scalability (multiple copies of your app running simultaneously) performance becomes an issue. You will need proper queueing solutions etc.